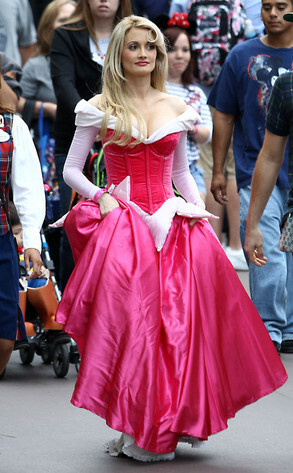 "Girl Next Door" and Dancing with the Stars alum, Holly Madison, dawned her Aurora get up at 2012's Mickey's Halloween Party at Disneyland. She didn't have the crown as the in-park character should but she appears to be accompanied by a Disneyland cast member (on the left) perhaps to keep her adoring audience or male pervs from pawing her. According the Entertainment Weekly she was also pregnant at the time. I think she looks great as that character and she obviously likes Disney as she is known to be a frequent guest. I guess she didn't get hassled by the cast members there for impersonating a Disney princess. Check out more on Entertainment Weekly.